The recent move by the Bank of Japan to take further measures to accelerate the rate at which it ramps up its balance sheet took almost everyone – market watchers included – completely by surprise. The consequence was reasonably predictable – the yen has once more fallen strongly against almost all major currencies – and most notably against the USD – and Japan’s main stock indexes are sharply up. On the other side of the balance sheet the cost of imported goods – and especially energy – is expected to rise, real wages are likely to continue to fall, and ex-tax inflation looks set to remain moderate, possibly around 1% – short of the 2% objective but comfortably away from deflation. Meantime this week’s GDP figure shows that the country fell back into recession again in the third quarter with a 1.6% annualized drop following one of 7.3% in the April-June period. The headline number makes it likely Abe will go ahead with snap elections in December, and indeed postpone the second stage of the consumer tax hike which was due to be implemented next autumn.Obviously, if what you are trying to do is stimulate inflation then sending the economy regularly into recession by weakening consumption isn’t going to help. But what all these conflicting signals underline is the lack of clarity about just what the principal objective of Abenomics actually is. Simply creating inflation cannot be the goal. If it is achievable on a sustained basis this inflation has to be a means to something else. For Paul Krugman that something else would be a lowering of the real interest rate via rising medium term inflation expectations. This lower real rate would – so the theory goes – stimulate investment in capital goods and hence provoke an ongoing (and self sustaining) recovery in the Japanese economy after years of sub-par growth. 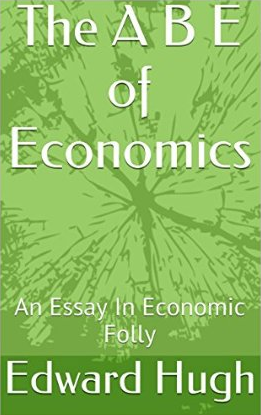 But what if Alvin Hansen was right, and in economies suffering from structurally weak consumer demand linked to ongoing demographic dynamics (and not simply a balance sheet recession) the principal determinant of investment decisions is not the cost of capital but the anticipated size of the future market? In this case even success on the inflation expectations front would probably not deliver the expected recovery. And there are downside costs. 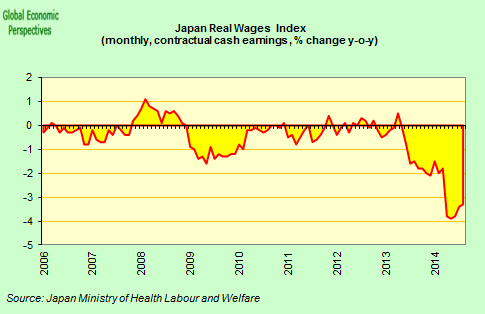 While financial markets boom, the living standards of the majority of Japanese families continues to fall as real wages drop month after month. It’s hard to see consumption booming in this case. 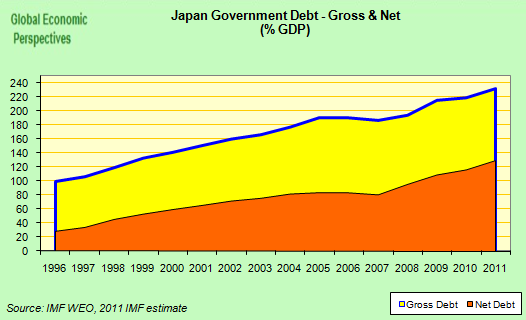 Then there is the debt: gross government debt current stands at around 245% of GDP. It is often argued that in a country running a current account surplus and using its own currency such debt doesn’t represent any special problem. I for one remain unconvinced that this is the case. This debt level, among other issues arising, effectively rules out any eventual “normalization” in interest rates since the servicing burden on the government would just be too high. But then – as some argue – this may now be old hat, since the Wicksellian natural rate of interest in Japan may have turned permanently negative. If, however, this is the case, why try formulate policy on neo-classical lines working towards a “classic” recovery? A recovery which may never come. If the natural rate is permanently negative we are hardly standing on the ground over which the traditional liquidity trap theory was built. But it isn’t only me who has doubts. Multilateral institutions like the IMF and the OECD also do. That is why they have been conducting debt sustainability analyses, and arguing for the consumer tax hike. Naturally proponents of the timidity trap suggest that such moves to bring Japanese government debt under control is a mistaken sequencing of priorities. 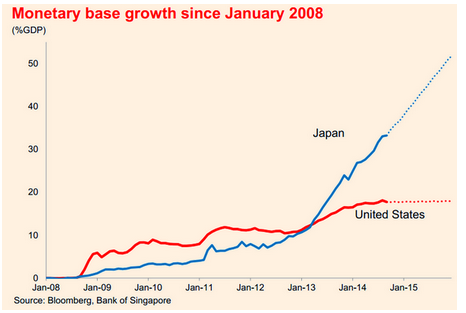 First get sustainable inflation going, then get a self-perpetuating recovery, then address the debt the argument goes. But doesn’t this beg the question of whether the objective is, in fact, attainable. The late Karl Popper started to think about what distinguishes science from other social practices by confronting the apparent “irrefutability” of ideological systems like marxism or psychoanalysis. The problem with such world views is that they never seem to be testable, there is never any clearly identifiable fact “in the world” which can refute them. The “timidity trap” argument gives me a horrible deja vu feeling in this sense. Each time things don’t work out as planned what Mr Abe and Mr Kuroda have to do is more of the same, no matter if you blow Japan clean out of the water, since the only reason the recommended recipe hasn’t worked to date is that the balance sheet expansion and the associated stimulus haven’t been big enough. I think it is time Paul came of age intellectually speaking and started to identify for us some concrete indicators which could prove his hypothesis wrong if they moved in the expected direction without producing the expected result, and stop telling us repeatedly that he has normally been right. What if the Japanese economy simply can’t sustain the desired inflation anymore, what if the historical epoch during which that expectation was feasible is now over? Obviously it isn’t difficult to generate a certain amount of consumer price inflation if you raise consumer taxes, and again you can also get it if you devalue your currency, and keep doing so. But as we are now seeing, you do need to keep repeating the moves. There doesn’t seem an underlying mechanism there waiting to be kick-satrted. Without more tax hikes last April’s increase will simply drop out of the inflation data by the time we reach next spring, and absent the implementation of the Abenomics 2.0 yen devaluation the currency-depreciation-induced inflation was already dropping out. The first round of Abenomics took the yen from 75 to 100 to the USD, the current bout has now taken it to around 115, but to keep injecting inflation in this way Kuroda would have to keep increasing the rate of balance sheet expansion on an annual basis and the yen would have to keep falling to lower and lower levels. In a globalized economy currency depreciation is a zero sum game. One man’s inflation is another’s deflation. The so-called “foolproof path” is only really effective in the case on a single economy (or currency area) but not in the face of a generalised problem. Under current circumstances those whose currencies are forced upwards simply import the deflation/disinflation that is being exported by the the devaluers and on and on we go. Paul Krugman has been pretty vocal in decrying those who have seen inflation where it wasn’t, but what if he himself is falling foul of his own trial-by-fire in seeing inflation where it isn’t in Japan inflation expectations? What if the drop in Japanese trend growth is long term and continuing, then why should we really expect the Abenomics experiment to work? As Gavyn Davies pointed out in a recent FT blog post, over the years growth expectations for developed economies have persistently turned out to be too high. Three of Davies’ colleagues at the research firm Fulcrum have examined the behaviour of long run GDP growth in advanced economies, and using customized versions of dynamic factor models they have produced a set of real time estimates of long run GDP growth rates. On analyzing their results they found an extremely persistent slowdown in long run growth rates for the G7 as a whole. More surprisingly perhaps, it looks like this slowdown has been ongoing since the 1970s, and is not just a sudden decline after 2008. Averaged across the G7, they traced the slowdown to trend declines in both population growth and labour productivity growth, with the combined impact being a halving in long run GDP growth trends from over 4 per cent in 1970 to just 2 per cent now. individual country level. As can be seen from the chart below, the Japanese case is a particularly clear one (the blue lines mark one and two standard error bands). But then comes the catch. Perhaps the key word here is “shortfall”. Shortfall relative to what? To what it was in the past, or to potential demand now. If it is the latter, then there must be something at work now, something beyond simple demographic and productivity dynamics (and the mountain of government debt), that is holding growth back. If that is the case, it would be interesting to know what that “something” was. Since otherwise Japan seems to be heading deeper and deeper into a very risky experiment based on a misunderstanding about what the problem facing the country actually is. 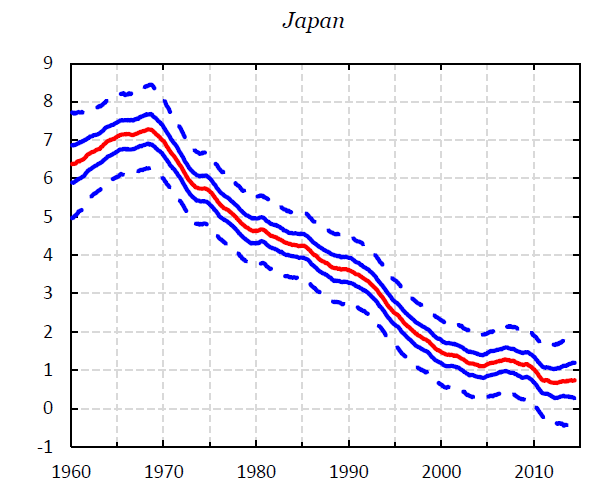 Pingback: The bad economic news out of Japan: what does it mean?